​Potter Valley has had its own schools since 1860. A Union School District was formed in 1866 and until 1919 covered three schools in the Valley: at Centerville (Main Street), Pomo (on East Road) and Lower Potter. The three schools were necessary because before modern roads were established, the slippery, wet soil and steep grades made getting from one end of the valley to the other a challenging trip, especially in winter. And while ten miles is an easy distance in an automobile, it was an all day trip on foot or horseback. In 1918, the Ukiah High School District established Potter Valley High School, joining Ukiah High to give that district two schools. The building that is now the Potter Valley Youth & Community Center was completed in 1921 and originally housed both the consolidated elementary school and the high school. The current elementary school was built in 1954, to meet the newest (at the time!) California state earthquake standards for school buildings. In 1928, Potter Valley acquired the first yellow school buses in Mendocino County, replacing two trucks with benches and canopy tops that had been owned and driven by community members. 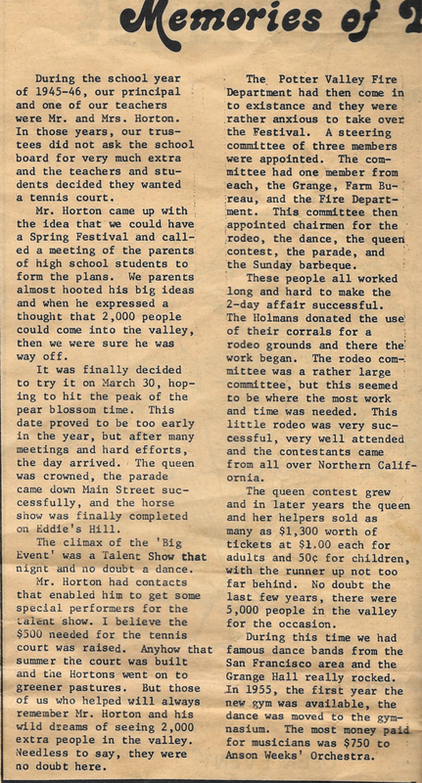 In 1965, the elementary school and the high school became part of the new Ukiah Unified School District. This was a controversial time, since there was concern that the new district would close the high school - and they did, in 1969. 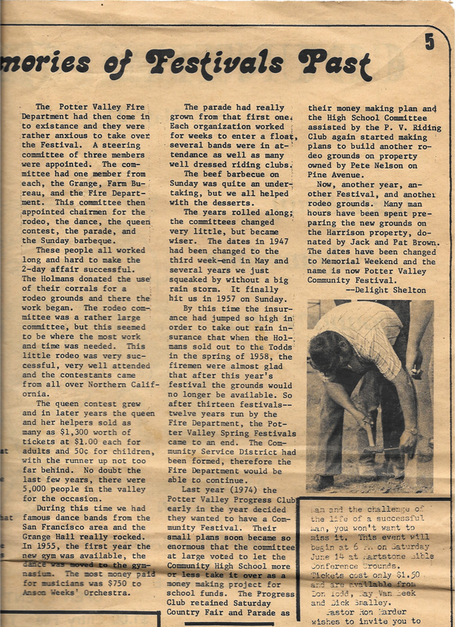 Some community parents banded together and created a private high school, called Potter Valley Community High School, which began in 1970 with 27 students. The school was funded with a patchwork of grants, donations, volunteer effort and a bit of tuition, and it succeeded through sheer community grit and determination. 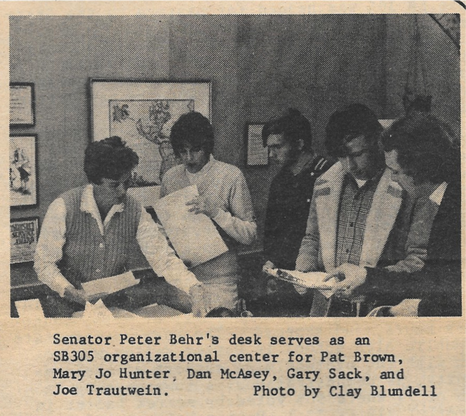 Enrollment was up to 80 in 1977. 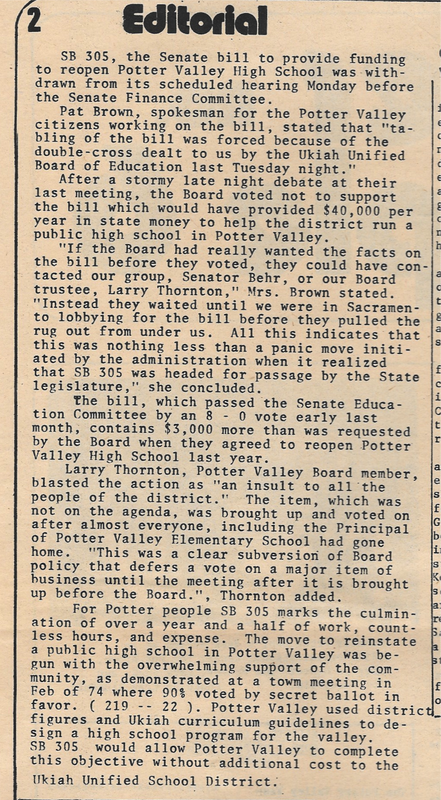 The community and the students lobbied the State Board of Education ceaselessly to reinstate their public school, including making several trips to Sacramento. 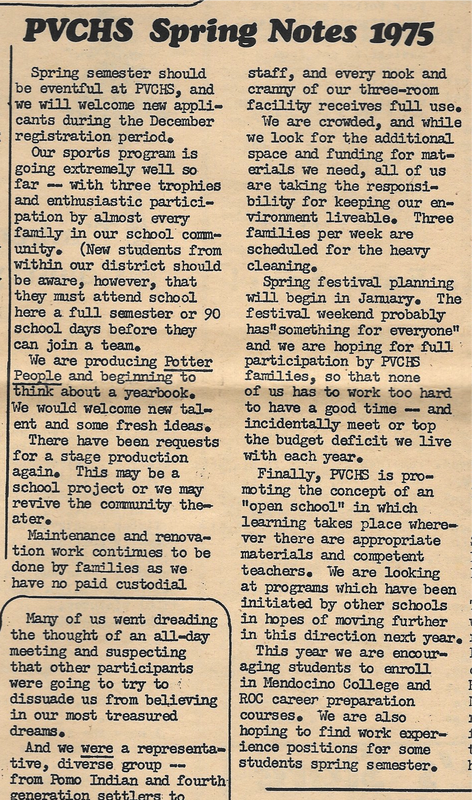 Their efforts were successful, and the Potter Valley Community Unified School District was reformed, consisting of the elementary school and the high school.